Shop for for medications to modify behavior problems in cats at VetDepot.com. "Modifying a cat's behavior requires consistency, fairness, and patience." Problem behaviors sometimes result from boredom and a lack of activity. It isn't too surprising that a cat that spends 10 to 12 hours a day alone will find a way to entertain herself and sometimes not in the most acceptable manner. If your cat seems to "get into trouble" while you are gone, try increasing the amount of exercise and attention that she gets before you leave. Kitty "fishing poles," tossing a crumpled piece of paper across the floor, or flicking a laser pointer across the wall are all ways of getting a cat to exercise. A tired cat will likely sleep away a large portion of the day and is less likely to scratch the corner of your couch to shreds. Also, give your cat some special toys to play with when you are away or place a perch near a window, particularly if it has a view of a bird feeder. Behaviors that owners take offense to, are naturally normal activities for felines, they are only problems when cats and humans cohabitate. For example, urine marking or spraying is a way for cats to delineate their territories. Cats are not being "bad"or trying to get back at their owners when they spray, it is simply a way of saying "this area is mine, not yours." To eliminate spraying, an owner has to deal with its underlying causes. In a multi-cat household, pets should have an ample number of perches, hiding places, litter boxes, food and water bowls and covered escape routes so that individuals can stay away from each other if that is what they wish. If a cat is responding to something that she can see through the windows, closing the drapes or blinds may be helpful. If anxiety plays a role, sprays, diffusers, and wipes like Comfort Zone with Feliway that contain feline facial pheromones and natural calming supplements like Composure Soft Chews are worth a try. 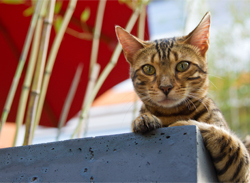 Modifying a cat's behavior requires consistency, fairness and patience. Punishment will only make matters worse. If despite your best efforts the problems continue, talk to your veterinarian. Sometimes a change in behavior is a result of an underlying medical problem. Your vet can also refer you to a veterinary behaviorist if necessary.